“When I graduated with my BSN in 2007, I always knew I wanted to pursue a Master’s degree in the future. With the various options of Master’s degrees in nursing, I had to think about what I saw myself doing in the future and how I could contribute to the field of nursing. Throughout my undergraduate education and during my first few years as a nurse, I was greatly influenced and supported by my teachers. It was their support and the relationships I made with my teachers that led me to pursue a Master’s degree in Nursing Education. I felt that becoming a nurse educator would give me an opportunity to make an impact on the field of nursing by helping to shape the nurses of the future. 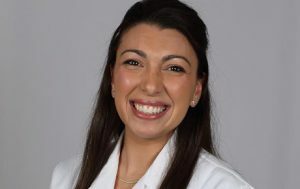 Additionally, the degree would still allow me to practice as a clinical nurse while also teaching adjunct clinical courses.” – Gina (Sallustio) Dovi received both her BSN in 2007 and MSN in 2014 from Ramapo College. Gina is a Clinical Level III Staff Nurse at Hackensack University Medical Center and an Adjunct Clinical Nursing Instructor. She was the 2014 recipient of the Nursing Excellence Award in Clinical Care at Hackensack, and earned her CPHON (Certified Pediatric Hemotology and Oncology Nurse) certificate in 2011.